Tank and combat accessories not included with purchase or as optional extras. Welcome to Battle Brew Tactical Nutrition, a South African Company focusing on a range of MCT based products. With the world starting to look at fats in a new light a huge interest in MCTs (Medium Chain Triglycerides) has been rekindled. This has sparked a large amount of research into these unusual fatty acids and the many positive effects they seem to have on our bodies. MCTs are rapidly absorbed by the body resulting in a significant energy boost but they also have other interesting properties. As MCTs are pure medium chain Fats they are suitable for those on Banting, Paleo and other LCHF diets. 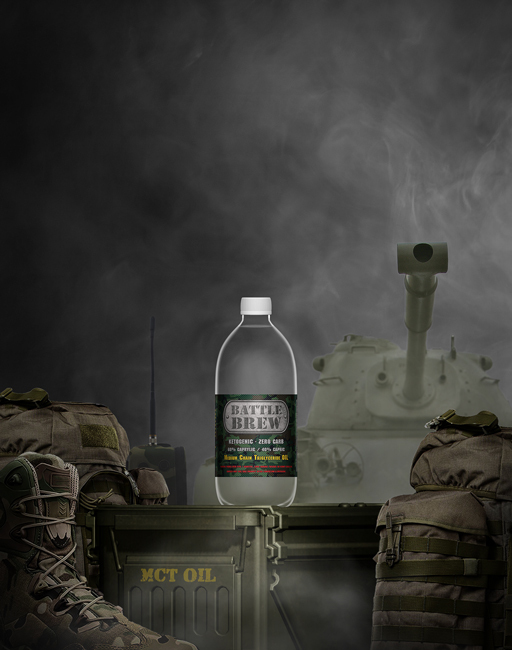 Our first product Battle Brew MCT Oil is already available for order and other exciting performance products are already under development in the Lab. WARNING - People with Type 1 Diabetes or Liver Damage / Disease should consult a doctor before taking MCTs (Medium Chain Triglycerides). MCTs are a dietary supplement, not a magic bullet, a replacement for medication or a cure for any disease however they have been shown to be useful alongside medication in a number of cases.